Two ambitious men. One historic mission. With a blinding flash in the New Mexico desert in the summer of 1945, the world was changed forever. The bomb that ushered in the atomic age was the product of one of history's most improbable partnerships. 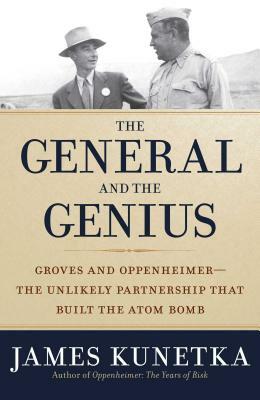 The General and the Genius reveals how two extraordinary men pulled off the greatest scientific feat of the twentieth century. Leslie Richard Groves of the Army Corps of Engineers, who had made his name by building the Pentagon in record time and under budget, was made overlord of the impossibly vast scientific enterprise known as the Manhattan Project. His mission: to beat the Nazis to the atomic bomb. So he turned to the nation's preeminent theoretical physicist, J. Robert Oppenheimer--the chain-smoking, martini-quaffing son of wealthy Jewish immigrants, whose background was riddled with communist associations--Groves's opposite in nearly every respect. In their three-year collaboration, the iron-willed general and the visionary scientist led a brilliant team in a secret mountaintop lab and built the fearsome weapons that ended the war but introduced the human race to unimaginable new terrors. And at the heart of this most momentous work of World War II is the story of two extraordinary men--the general and the genius. James W. Kunetka is a bestselling novelist and the author of two previous books about Los Alamos and the Manhattan Project. As a consultant at Los Alamos with top-secret clearance, he evaluated classified documents in the archives for their historical value. A retired associate vice president of the University of Texas, Mr. Kunetka lives in Austin.